Always good to do a proper test of equipment after repair – especially, after a power supply repair – see recent post 8663A pwr supply repair. In most cases, all will be fine, but this time, another failure followed the initial repair: the -10 V rail showed an error, only providing about -8 V to the instrument, not enough, to keep it going. 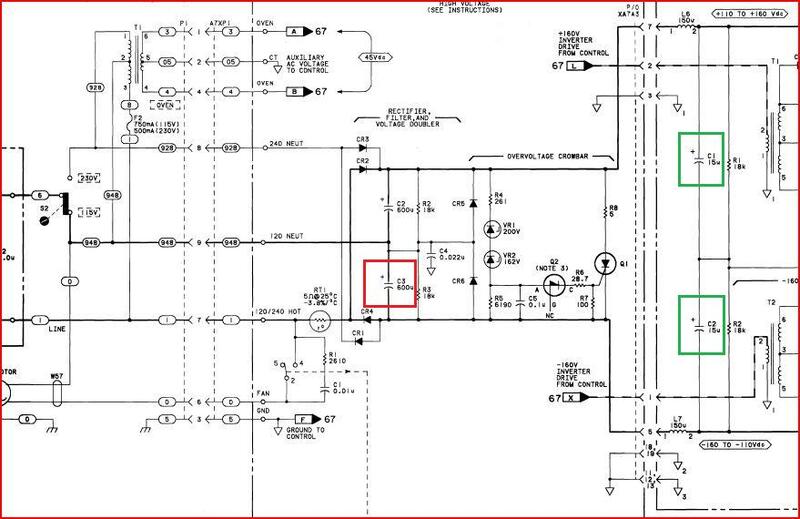 An issue with the A7A1 assembly, linear regulator board, hp part 08662-60157 (the HP 8662A uses an identical assembly). After some checks it was clear that the final pass transistor Q2 was OK, and that there was no current limit issue (by checking the voltage drop over the sense resistor, R36). So, I guessed, something must be wrong with U2, the actual regulator. 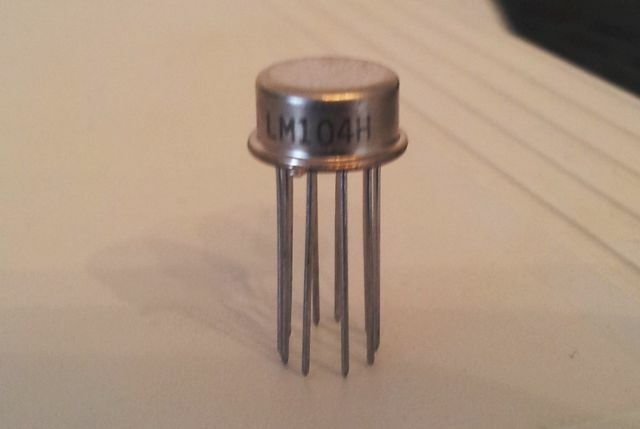 This is a 1826-0016, alias LM104H. Not quite a common part, at least, I didn’t have a spare on hand. Found some new old stock online, about USD 3 per piece, well, not too bad. It arrived a few days later, but, the exchange of U2 was to no avail – still no regulation. Well, I should have done a proper check earlier – turns out, the transistor Q7 (2N2904A) didn’t provide enough current for the final stage, despite being fully driven by U2. 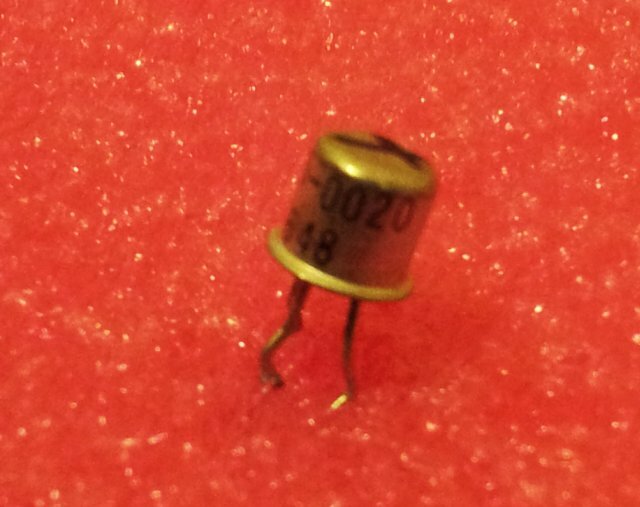 This time, I had more luck and found a 2N2904A in my parts collection (datecode: 7050 – 46 years old – but still working, hfe=170). Some final test with a 25 Ohms power resistor to test under load, before risking any damage to the venerable 8663A. And, long story short, all is good now. A heavy guest on my bench, a 8663A signal generator. These generators are exceptionally clean, perfect for close-in noise measurement and receiver checks. Still today, hard to find a cleaner source, especially not, if you are on a less than USD 30k budget. Symptom – easy to describe. Unit turns on, but only briefly, then switches off; over voltage protection light activated at times; a lot of noise on the DC rails when shorting out the safety circuits. After some probing, the culprit could be located: one of the input capacitors. While this is a common failure mode of other equipment, these caps don’t fail too often for such HP equipment, because only best-in-class components were used, and these are typically run cool, for long life. Still, one of these 32DR6593 SPRAGUE Compulytic caps failed (resistance about 100 kOhm, virtually no capacitance, rapid self-discharge when charged to 50 V for test, framed red in the schematic below). These were replaced by 81D series Nippon Chemi-Con (Vishay) caps. 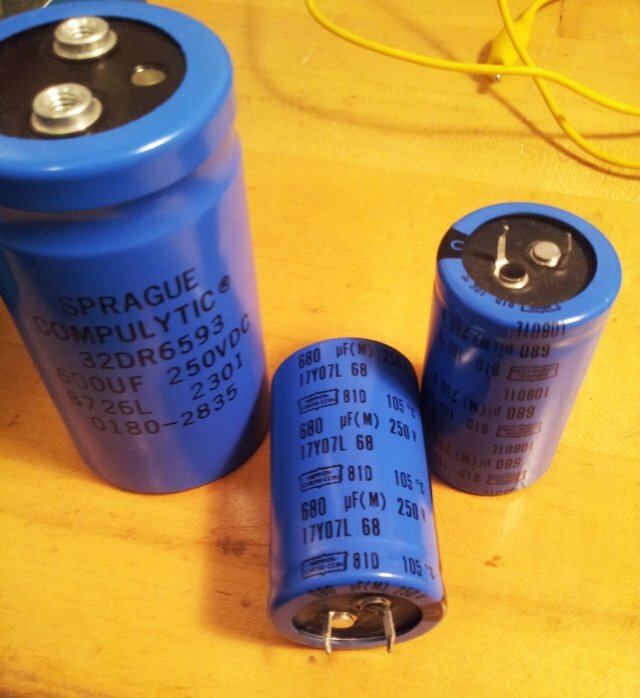 To call this a successful repair, you might wish to check the ESR specifications – the SPRAGUE had about 0.25 Ohms, the Nippon 81D (680 µF, 250 V) has about 0.198 Ohm, good enough. Note that the 600 µF screw-type terminal caps might still be available, but they are pretty expensive, so I opted to for Nippon Chemi-Con, USD 2.50 per piece, surplus, rather than USD 50 for a pair of screw-type caps. I still think it is a good compromise, because this is not about restoring old equipment, but to make this unit working again, quickly, and at lowest cost. 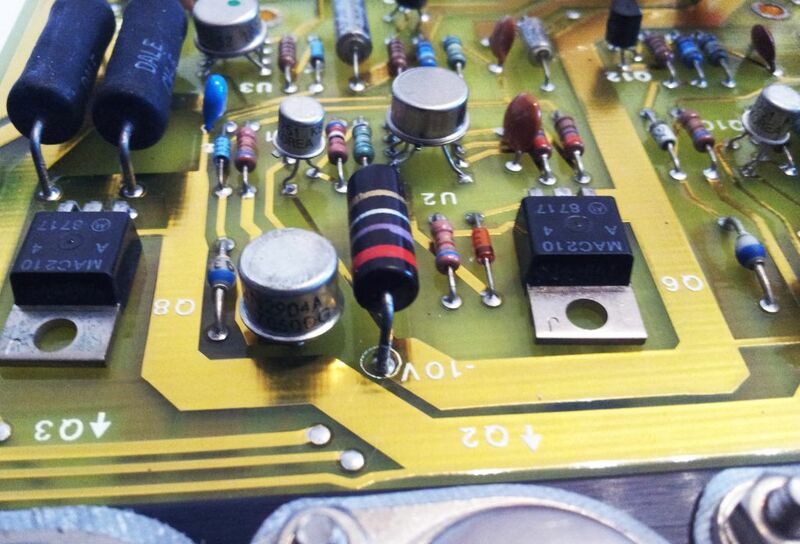 Some repair is also needed on the A7A3 board – there are 22 µF caps that provide a low impedance DC input to the switching transistor, these are essential for operation (framed green in the schematic). They still work, but were hot, and stressed, possibly overstressed, by the dead main cap. Their can be replaced by any good cap, I use Shiangchen GSA T axial caps, 105 deg C rated. Note that the schematic calls for 15 µF, but 22 µF (measuring about 28 µF) were present in the circuit. With the power supply disassembled, always a good idea to take out the boards for cleaning, and for re-tightening of the screws holding the various TO-3 regulators in place. Some of these were pretty loose (no wonder, with 30+ years of thermal stress on the boards). 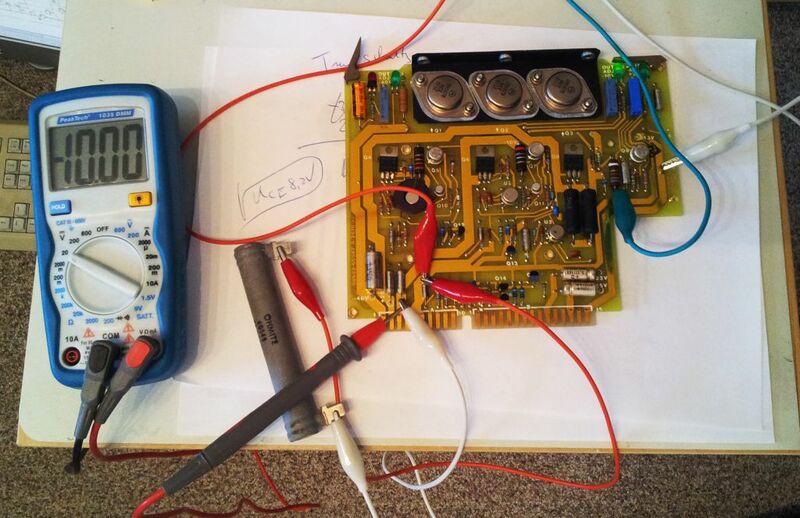 After the repair, add thermal compound to the heatsink/cover – this power supply has a rather critical thermal design. 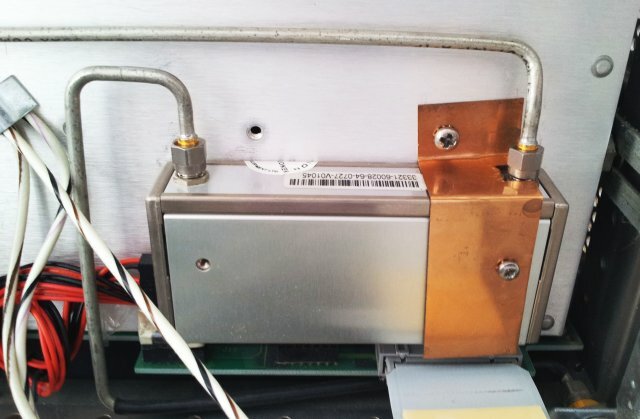 Then, make sure to check the insulation resistance and electrical soundness/earth leakage, which is always a good idea after repair of switchmode power supplies. Over a year ago, I got hold of a defective 8663A. It seemed beyond repair, but hardly any equipment is, provided, you put in sufficient effort. The 8663A is certainly worth any resonable effort – it is a marvelous piece of test gear, providing full evidence of human ingenuity. It is said that a team of no less then 20 of the best HP engineers took about 5 years, with full support of the mighty HP organization at the time, to develop the 8662A and later the 8663A generators. Ever since then these were the gold standard for any low close-in noise source, for phase noise measurements, and so on. 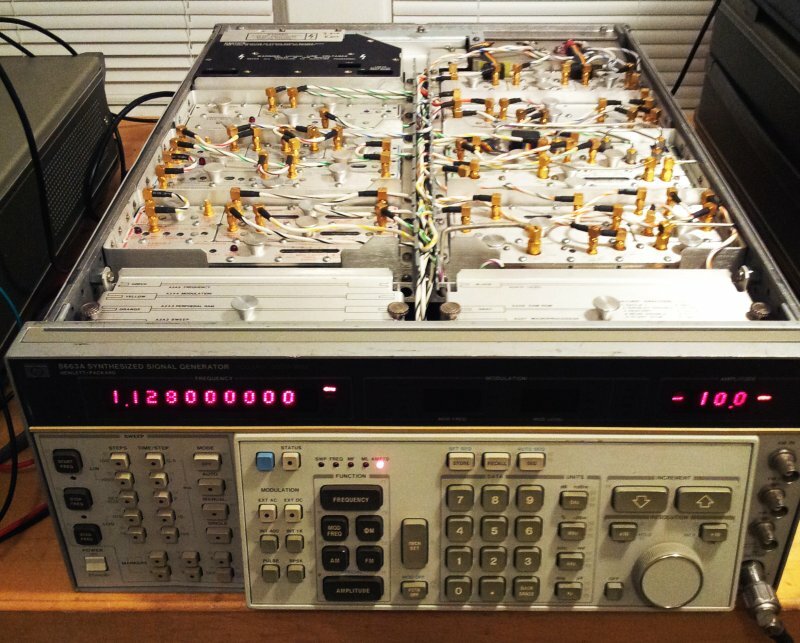 Keysight is offering a replacement now, the E8663D, about USD 50k, nothing compared to the 8662A or 8663A, for its historic value, and comparing the sheer mass of metal, the amount of gold on the assemblies, and the variety of strange little parts. (1) A missing attenuator. The 8663A uses a pair of mechanical attenuators; these come in a set, together with a calibration ROM; with one of the attenuators missing, we might need to check flatness and level accuracy once replaced. (2) Some intermittent failures of the A6A4 output sum loop. Seems to depend on frequency but not limited to any particular range. Supplied some test signals to the A6A4 assy and the fault really seems to reside with this assembly. 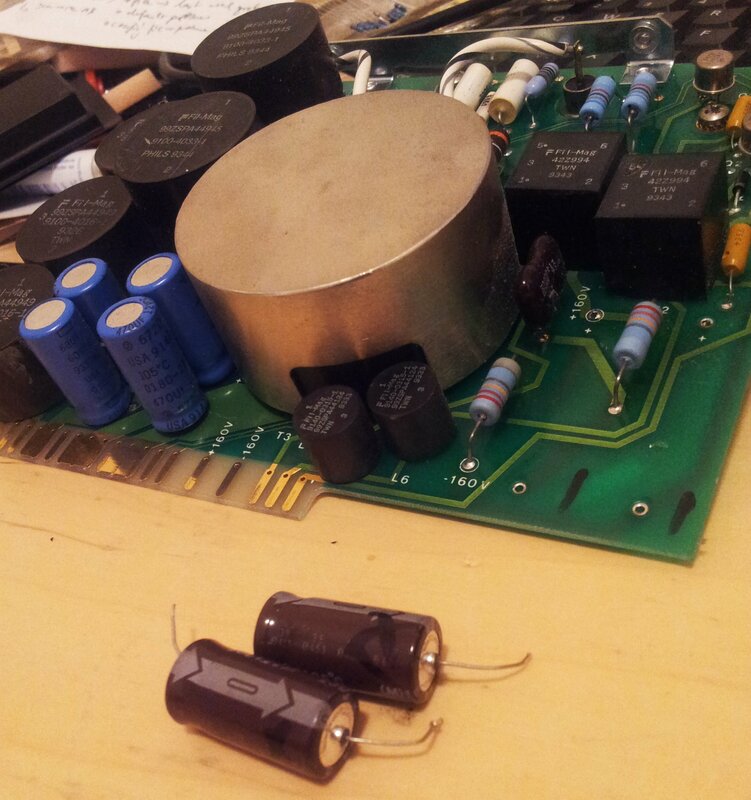 (3) A defective output amp. P/N 08663-67002. This is a real disaster. 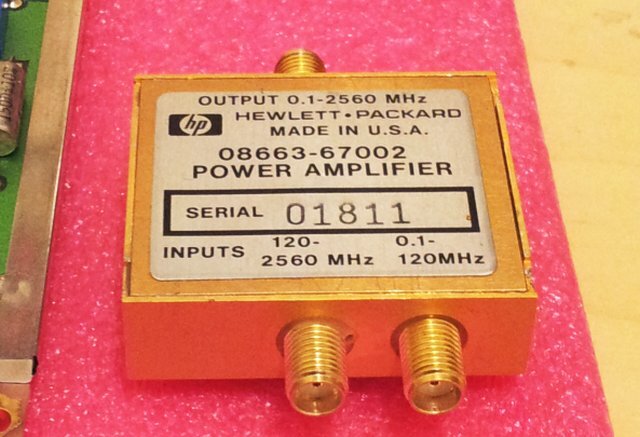 The output amp is a microwave microcircuit, with HP GaAs FET transistors. Needless to say, such assemblies were very expensive already at their time, and spare assemblies, despite long search, are fully unobtainium. 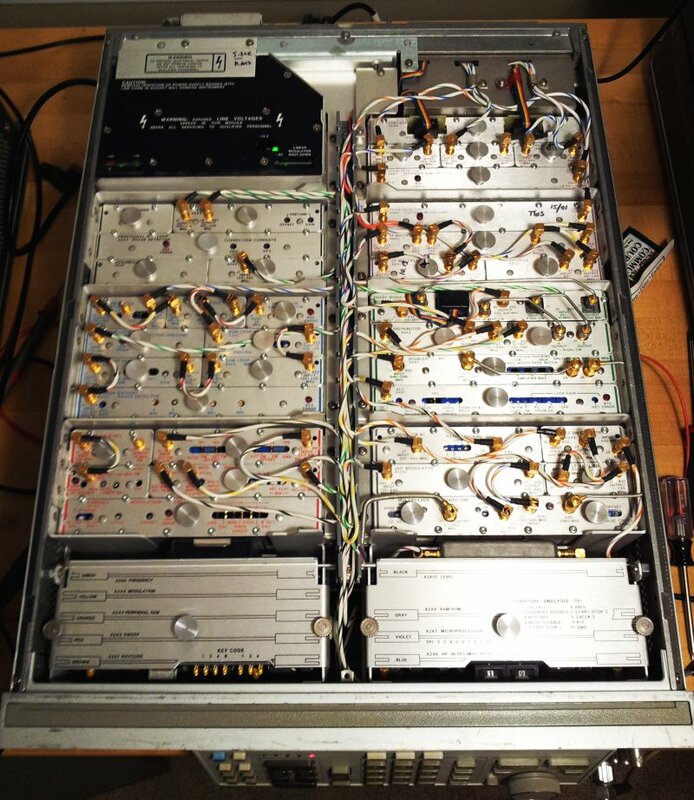 First things first – the attenuator. Found a spare attenuator that should be resonably close to the orgininal one. Did a quick check – it has very flat frequency characteristics anyway, so the ROM calibration coefficients might not be too significant (the 8663A has +-1 dB level spec, but typical accuracy appears to be more like +-0.2 dB; relative levels about +-0.1 dB). Someone tool the attenuator from the ‘dead’ unit, including the bracket – well, I didn’t spent too much time (as you can see) to fabricate a replacement. Good enough. The intermittent fault of the A6A4 assembly – these assembly seem to be the weak point of the 8662/8663 series – I have already fixed a few of these. With schematics around, no big issue to fix – still it took a few hours this time. 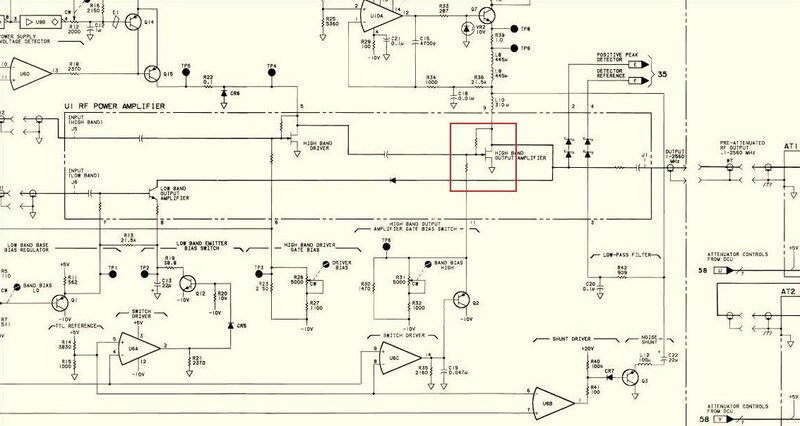 Turns out, the pre-tune DAC, which is a discrete circuit using 4 FET switches (1 per bit), showed erratic behavior. 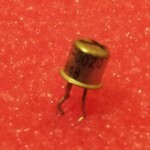 This was traced to one of the FETs, of the common 1855-0020 type – I took one from an early 80s HP parts units (8569A). 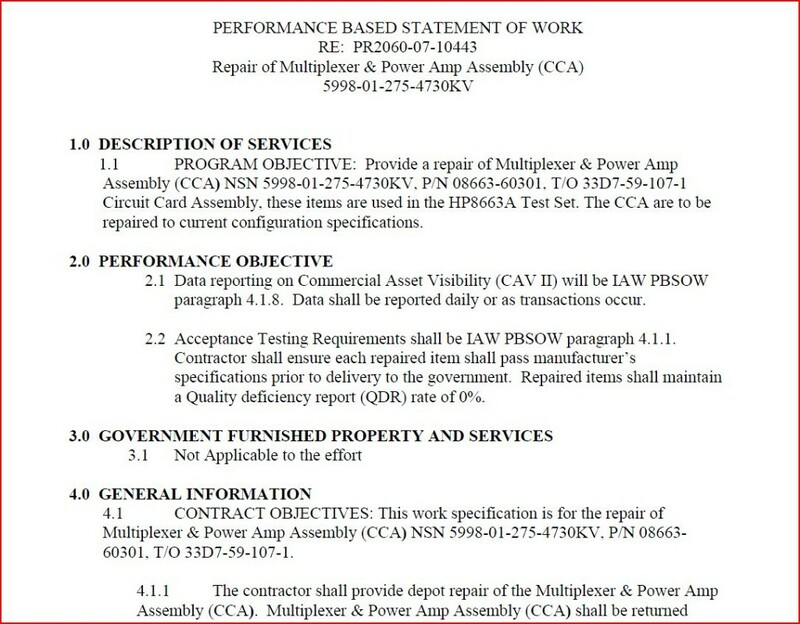 The most critical item, the 08662-67002 amp. 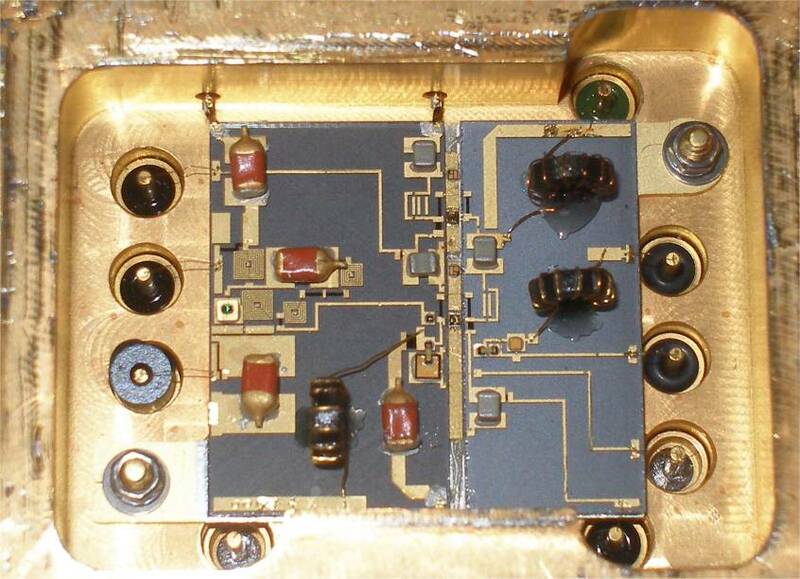 This has a low frequency (<120 MHz), and a high frequency input (>120 MHz), which are routed to a common output, providing about 20 dBm of power, at low distortion (about 35 dBc), over the full band from DC to 2.5 GHz. 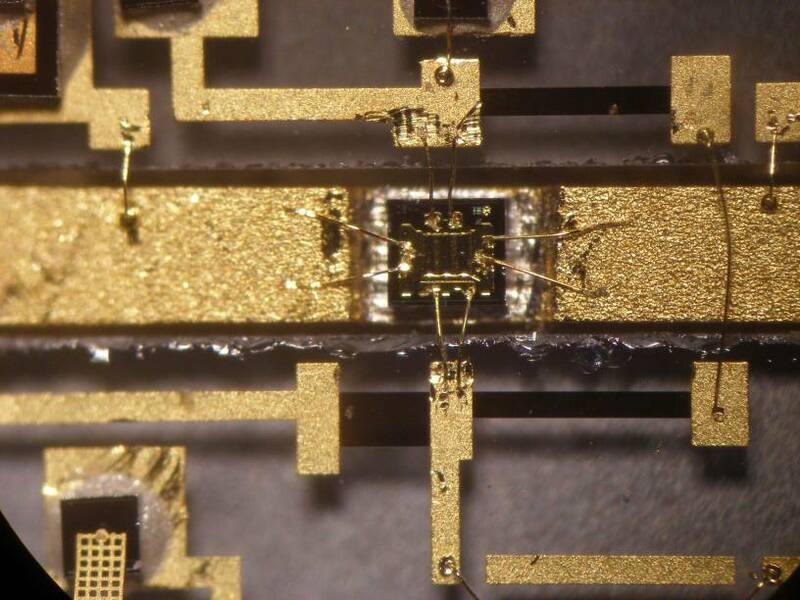 After opening up the microcircuit, it is pretty clear that the last of the FET transistors is blown, and shorted to ground. 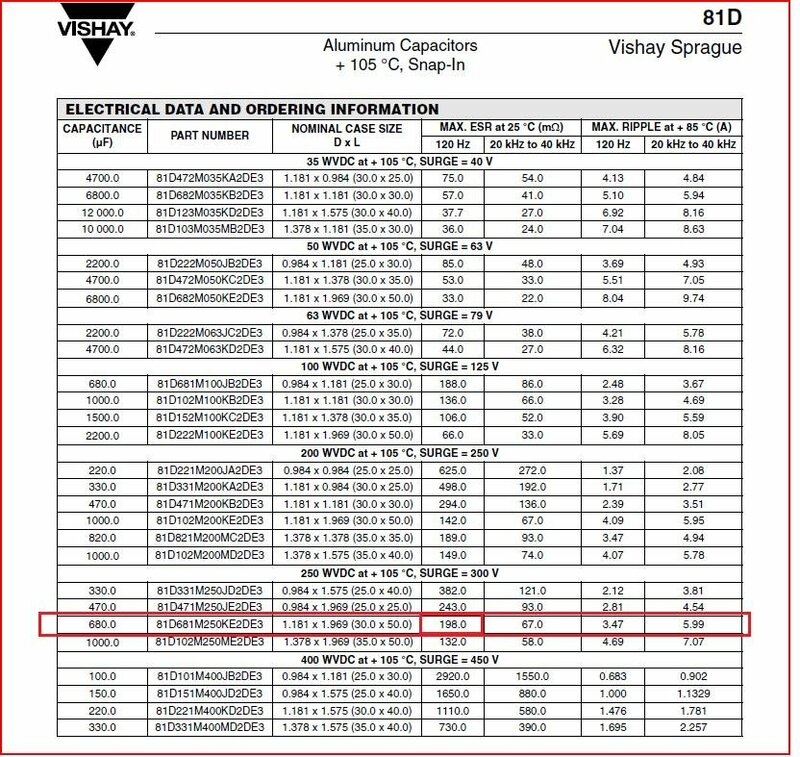 This is all sapphire substrate, wire bonding, high frequency art. Beyond my capabilities (do you have a wire bonder at home, and a steady hand, and the skill and knowledge? Please teach me!). However, this world is not all bad, and rescue came along, back in good old Europe – in its South-West corner. 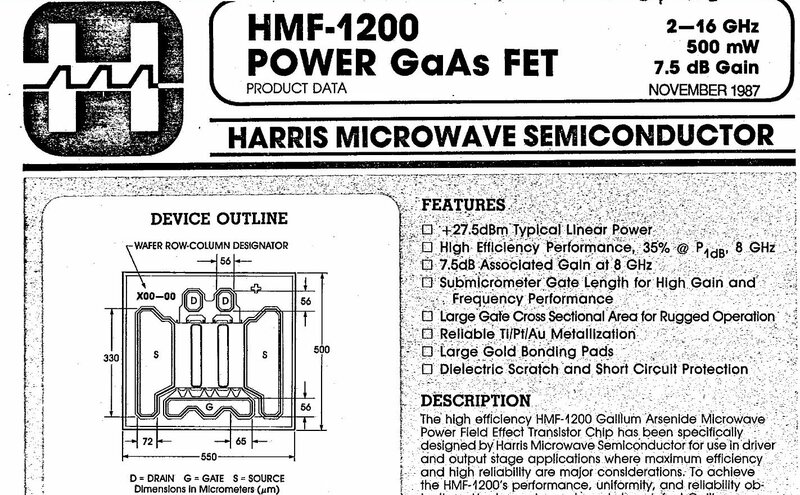 Turns out that a HMF-1200 is a suitable replacement for the proprietary-unknown original HP part. This is the associated board, with a PIN switch, and some bias regulators. After all these repairs, and some adjustments (which took another few hours; including amp bias, lock detectors, ALC, FM VCO, …), the machine is working again – uptime so far, 48 hours at full power – consuming 500 Watts, and 100 mW at the output. Like powering a 100 W light bulb, from a 500 kW supply…. not quite efficient but a good heat source for the house, during these cold winter days. To come: some flatness and level checks of the attenuator, but don’t expect any bad surprises. 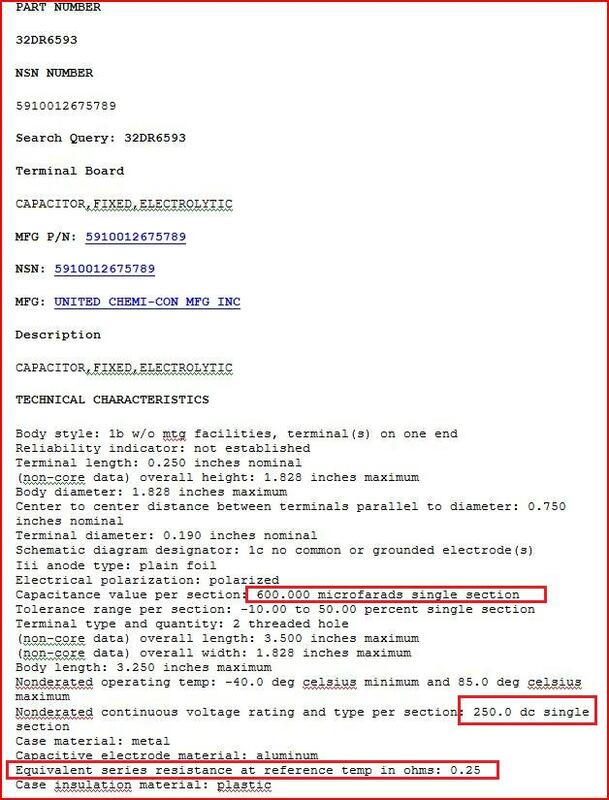 An interesting document, found during the search for spare assemblies – the US Air Force also seems to be looking for repair, for 4 pcs of the amplifier assemblies, for their F15 Tactical Electronic Warfare System Test Set, P/N 001-006730-003. May be a good business opportunity, but not for me!